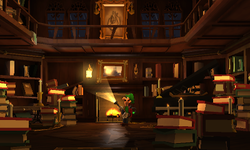 The Library is a room in the Gloomy Manor in Luigi's Mansion: Dark Moon. It is a two-floor room that can be accessed in several different ways. The first floor of the Library is accessed by taking the left door in the Kitchen or by taking the north door in the Common Hall. The second floor can be accessed by taking the north door in the Lobby or the left door in the Dining Room. The first floor of the library has several large stacks of books on the ground with candles on top of them. There is a large fireplace, although unlike the other fireplaces in the mansion, this one doesn't function as a secret passage. A grand piano is found near the fireplace and a globe can be found to the left of some stacks of books. On the top floor, there is a painting of a flame which the Dark-Light can be shone on. While in the Rafters, Luigi will be above the Library. During Quiet Please!, Luigi needs to go the Library to investigate the noise that is coming from it. Inside the Library, Luigi needs to battle three Poltergeists. In Sticky Situation, the Library is one of the rooms that is always covered in spider webs. In this same mission, the piano and several stacks of books are missing. Shining the Dark-Light where the piano used to be reveals this mission's Boo. In Visual Tricks and all subsequent missions, the player can use the Dark-Light on the missing globe to cause it to reappear. After having it reappear, vacuuming the globe and launching it causes the amethyst to pop out. The Player is also able to look out the windows on the second floor. Though nothing is seen or happens by doing so. This page was last edited on September 11, 2017, at 00:43.